Until recently, cyberattacks against industrial control systems have not been very visible, and purportedly less frequent than IT attacks. However, industrial control systems have recently become a major focus for attacks and are now among the top targeted sectors worldwide. To help address the risk to computer-based endpoints in automation systems, Rockwell Automation partnered with Symantec Corporation to provide endpoint level security. 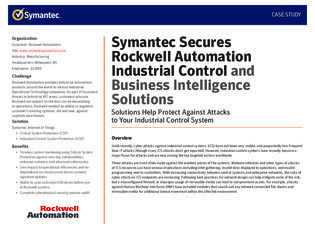 Download this case study to find out the benefits Rockwell Automation saw when they implemented Symantec’s Critical Systems Protection (CSP).